Panasonics’ robotic device for nursing care- Resyone, which uses robotic technology to help users get out of bed, has become the first product in the world to obtain global safety standard ISO13482 for service robots. Resyone is a robotic device built on an entirely new concept which fuses an electric care bed with an electric reclining wheelchair. 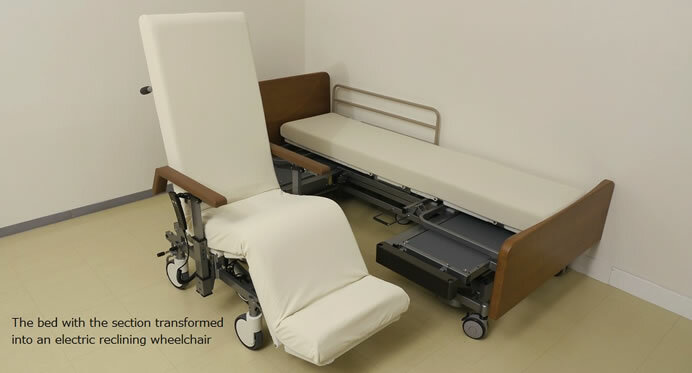 Part of the electric care bed detaches off to serve as the electric reclining wheelchair, thus allowing the user to easily transfer from bed to wheelchair without placing burden on the care giver. With Resyone, only one care giver is require to support safe and simple transfer between bed and wheelchair, thus lightening the load for care givers and making it easier for care receivers to get out of bed whenever they desire. JQA President Osamu Morimoto presented the company with its certification at an event held to present the results of a project to commercialize lifestyle support robots organized by the New Energy and Industrial Technology Development Organization (NEDO).